Angled Ceiling Plate,Designed for rooms with angled ceilings. Allows any standard SuperPole to accommodate ceilings with a 45 to 90 degree angle. Designed for rooms with angled ceilings. 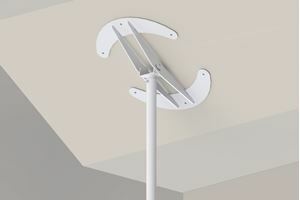 Allows any standard SuperPole to accommodate ceilings with a 45 to 90 degree angle.